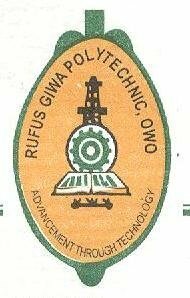 Rufus Giwa Polytechnic, Owo (RUGIPO) Orientation Programme Schedule for Freshers / Newly Admitted Students for 2018/2019 Academic Session. Authorities of the Rufus Giwa Polytechnic, RUGIPO has announced the date for the orientation proramme for all fresh and newly admitted students for the 2018/2019 Academic Session. RUGIPO Orientation programme is scheduled to commence on 28th January - 1st February, 2019. Recommended: RUGIPO Academic Calendar Schedule for 2018/2019 Session. All Fresh Students are expected to attend the event.